I could tell you which clients “made” and which didn’t, and that’s where it’s at in the dog-walking business. Instead I’m going to write about something that happened this spring. Memorial Day morning we left Bryce Canyon en route to Richfield, Utah’s WalMart. 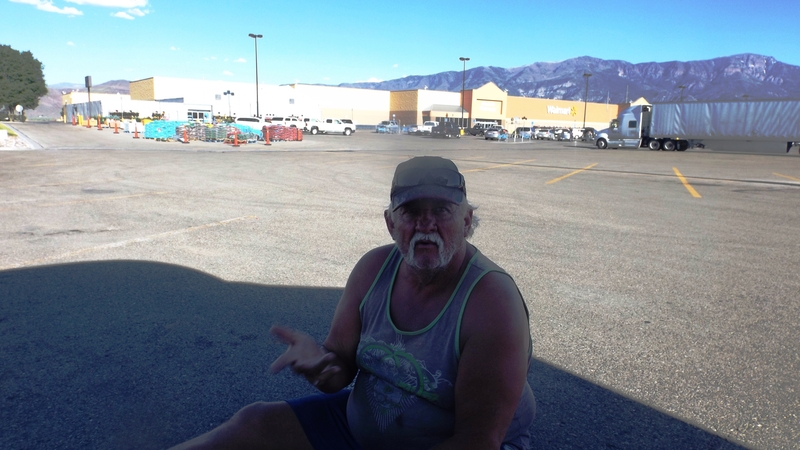 WalMarts often harbor an old RV or truck camper whose residents work a high-traffic corner soliciting money. Some say they’re stranded, others sit with soulful dogs, and most ask for help feeding their families. In Richfield we re-provisioned and watched a street corner panhandler ply his trade. His cardboard and Magic Marker sign said that he is a disabled vet, and needs help of every kind. Back in Cedar City we had watched a clean, fortyish woman with a bible-quoting cardboard sign emerge from an old trailer to work a similar corner outside that WalMart. She stood there for two hours in a Mormon town on a fine Sunday afternoon only to get shut out completely. One or two cars even stopped to berate her for her effort. As with every other occupation, some people are more talented than some others, and certain point of sale materials work while others don’t. It’s probably better to be a disabled veteran on Memorial Day than to be a needy Christian on a Sunday afternoon. My hypothesis: churchmen (and church ladies) feel just a tad sanctified when they gave earlier in the day. Raymond the disabled vet in Richfield didn’t do real well, but somebody gave him a bag of burgers from Carl’s Jr., and we saw three others stop to thank him for his service and drop a greenback or maybe even a five on him. When he’d earned enough he retired to his camper van in the WalMart lot. After some loud cursing at no one in particular about who knows what, he came over to chat with the Mayor of WalMart (the Kat). He was a little scary – you can’t help but wonder about his mental condition – so I went outside to discourage him. Raymond said the Army trained him for ‘Nam but didn’t send him. If so he is a veteran in the same sense I am: the Army taught me and Ray to kill but spared us an all-expense-paid vacation in Southeast Asia. I’m skeptical because Ray looks too young for Viet Nam but a bit old for the Gulf War. He told us that in a few months he’d start drawing his Social Security, but does this guy look 61? Sane or not, Raymond is unemployable because he’s seriously deaf. There is no Federal or state program to help those too deaf to work. But sometimes a hearing aid manufacturer will provide a set to someone penniless who has an interesting story. Kat advised him to visit a hearing aid shop or two, and to take their free examination. When they try to sell him hearing aids, he should explain that he can’t buy because he has no money because he doesn’t have a job, and that he can’t get a job because he can’t hear his interviewer. It’s a long-shot, but that’s better than no shot.